Seriously, do cookbooks get any more beautiful than this?! 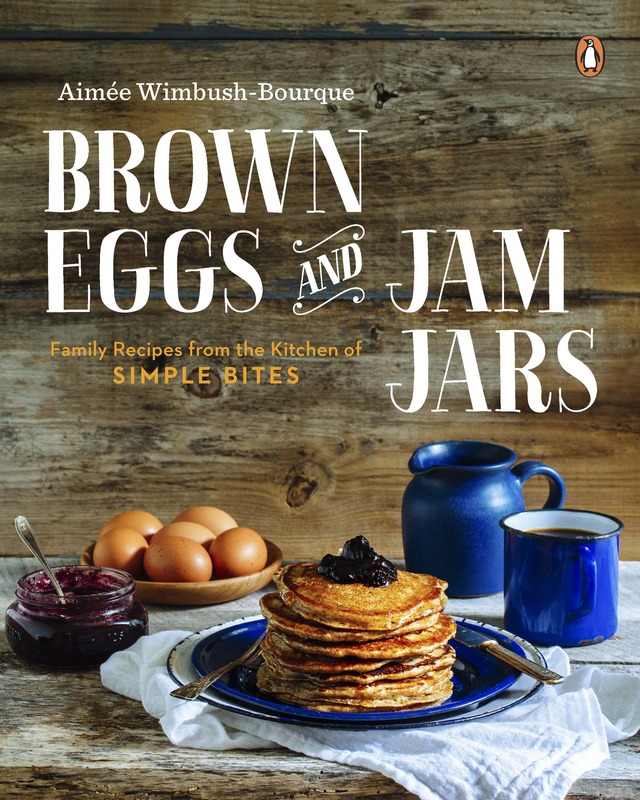 Brown Eggs and Jam Jars is the gorgeous new cookbook from Canadian food writer Aimee Wimbush-Bourque, editor of the Simple Bites website and urban homesteader extraordinaire. I was so excited to receive two copies of this book fresh off the press – one you won’t be able to pry out of my sticky maple syruped hands, but the other one has been kept in a high, clean place just for one of you, so make sure you enter the giveaway below! I have a list of 12 recipes to try from this cookbook, and that’s only from my first skim through. Everything from roasted asparagus with eggs and bacon to cinnamon shortbread bars with dark chocolate ganache, this book is bursting with delicious inspiration. 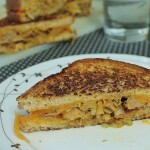 Aimee has a fabulous way of making homemade, whole food simple and family-friendly. Her writing is my favourite kind – comfortably informative and knowledgable, not preachy – with sections on everything from how to talk to your kids about the fact that you eat those chickens in the yard to how to get maple syrup out of the tree. 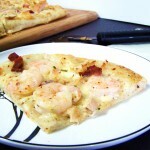 The first recipe I had to try was her Honey Whole Wheat Pizza Dough. 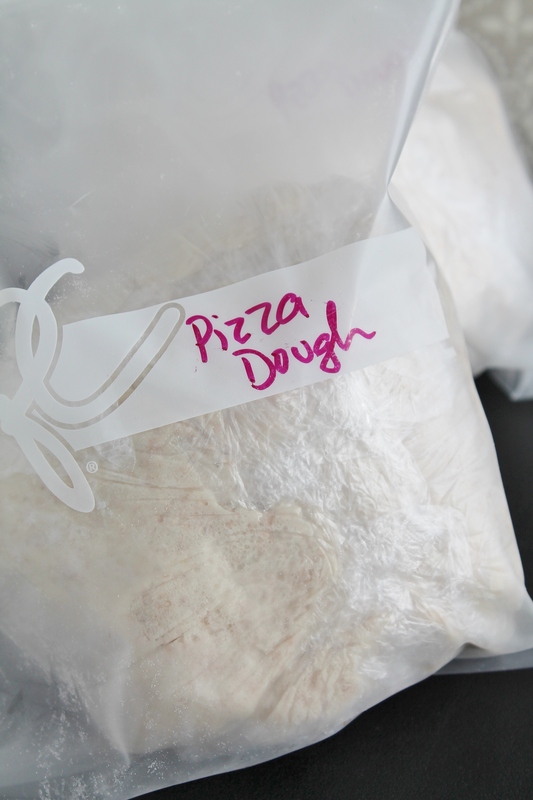 We have pizza night almost every week, and I have a dough recipe I use every time, but several people have told me they have less-than-consistent results with it. 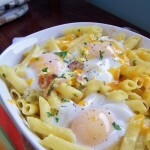 That means I need a better recipe, not just one that works for me, and this recipe absolutely delivered. We change up the toppings every time, and this time was classic pepperoni alongside chicken, mushroom and leek. 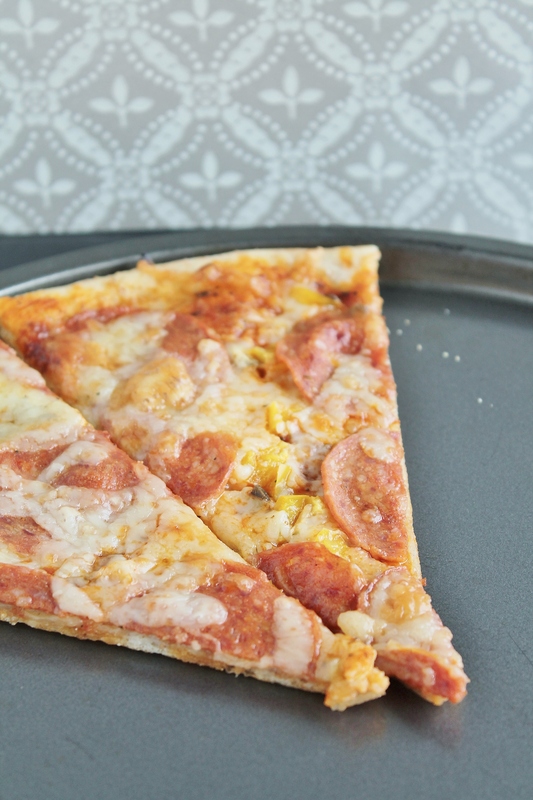 My kids love helping top our pizzas, and will eat almost anything in pizza form, making it one of my favourite ways to introduce them to veggies that often get hidden in other dishes. I rarely post pizza recipes because I tend to use whatever I have on hand, but that mushroom leek combo might need to be figured out and written down because it was gooood. (So was the pepperoni, but I’m guessing you can figure that one out ;)). We always have whole wheat pizza dough, as I find the nutty, stronger flavour stands up better to toppings, and this recipe had a perfect mixture of crunchy outside and chewy inside. The dough was stretchy and soft, and easily strong enough to be picked up and transferred to the cookie sheet. My only complaint is that the recipe does not include any cooking instructions as to time or temperature. I just went with the 425 degrees my old recipe called for, and cooked for about 15 minutes, and it worked well. Pizza night will be back again soon, and happiness will abound. 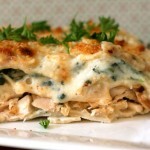 The recipe is in the cookbook you all want to get your hands on, so let’s get on to the fun part! To enter the giveaway, all you have to do is leave a comment telling me the food you would most like to grow in a garden for your family to eat. If you could plant ONE type of seed, what would it be? (Can you tell I’m planning a garden for our new house? I want to pick your brains :)). In case you don’t win here, be sure to check out my fellow bloggers’ posts all this week as part of this book’s Food Bloggers of Canada blog tour – EVERYONE is giving away one of these beautiful books! I’ll be updating the links through the week as their posts go live. Contest is open to Canadian & American mailing addresses only, to those who have reached the age of majority in the province, state or territory in which they reside. Giveaway closes February 23, 2015. Penguin Random House Canada provided me two copies of this book. I was not otherwise compensated to write this post and all opinions are, as always, my own. Thanks so much to all who entered!! The winner , thanks to Random.org, is #108 – Annet! Zucchini! Love to fry the flowers, and freeze them for baking in the winter. We don’t have a lot of room for a garden per se in our yard but we do container planting. I would recommend tomatoes. We do enjoy out raspberry canes and our rhubarb plants. There is a family story about the rhubarb that always makes us chuckle. I love baking rhubsrb custard pies. I have perfected my mom’s recipe. I freeze it until it slows down growing. I ran out last year early. I have to figure out where I can plant more in my west facing backyard. Quite hot for rhubsrb. Wish me luck. Tomatoes! Nothing beats a warm, sun-kissed tomato freshly picked from your garden! No question…there is nothing like fresh homegrown tomatoes with a little salt and pepper. Oooooh – I love parsnips! Cherry tomates! They never even make it in the house! I am going to grow corn this year. I am so frustrated that I can’t get yellow corn in the grocery store around here. All that is available is white. Greens and beans.., and anything the squirrels don’t get! Garlic!! My dad started planting it a few years ago and it’s the most amazing flavour! I didn’t realize most our garlic comes from China and I found it was going moldy so fast! The homegrown stuff is incredible!! And we use so much of it! You can’t go wrong with basil and parsley (if you want to make pesto)! I think if I could only pick one thing, it would have to be kale. It is so versatile, so nutritious and so hardy! Tough choice, but if I had to pick one: tomatoes! I would grow green beans so that I could can them to have fresh all year! I’d love to grow butternut squash in our garden. So many yummy things to make with it, and my kiddos love it. Potatoes! The new potatoes are what we look forward to most each summer! Kale and Swiss chard…they stay all year and so much can be done with them. Of course fresh green peas are lovely with baby potatoes and a dab o butter. Blackberries & Raspberries! Nothing better than fresh picked berries, so versatile! Onions! I raised three kids and of all the things they were picky about, no one ever complained about onions, so I was very liberal and used them in lots of things. To this day, my daughter still likes onion sandwiches. I would plant leaf lettuce, nothing tastes as good for a salad. I would plant an avocado tree! Mmmmm….avocado. Basil, I never have enough of it. An apple tree. The apple is so versatile and once it’s planted you don’t have to do anything but maintain it. Everyone loves apples! Herbs! I’ve grown them for 30+ years and cannot do without them. If I have to choose just one herb, it would be CHIVES! I’d love to successfully grow strawberries. I’ve tried many times only to have either animals or heat and sun take them out. If I had to pick one … peppers, because I am addicted to making pepper jellies. I have a lot of space to grow food and have been for a few years now. Good luck with your garden planning. I would grow rhubarb…and I would love to win a cookbook. Hands down it would be basil. I use SO much basil and having it ready to pick on any given day is a must for me. Heirloom tomatoes, without a doubt! I would love to grow kale. I’d want to plant berries! Delicious. Choosing one, I think I’d go with raspberries. Yum. I’d have to say corn. Nothing is better than fresh, homegrown corn! Greens! I’d do a spicy mezclun mix. Easy to grow, produces for an extended season, big yield, way cheaper/fresher than from the grocery or farmers market, and so delicious picked straight from the garden. Definitely garlic! From scapes early in the season to bulbs for the whole year, nothing beats fresh garlic. I’m going to try some lettuce and other greens this year. And more beets & beans. Zucchini, squash and tomatoes are always great and I always have loads of extra, which is fun to share! Swiss chard! It does well in the heat, it’s OK with chilly weather too. You can use it raw or cooked. The only thing that would be better about swiss chard is if deer didn’t like to eat it. That’s a hard one. I’d say tomatoes. My kids would say okra. Tomatoes of course! We have a large garden each summer with many different veggies in it. But we would be totally lost without the tomatoes!! I love fresh snow peas from my garden! Tomatoes! I want tomatoes that taste like they seen some sunshine in their lives. Tomatoes- it would have to be tomatoes! Tomatos…there is nothing like garden-fresh tomatoes! Arugula! It’s a great versatile crop from herb to salad green. It also grows super well on the East Coast. We go thru a lot of kale in our house. I have yet to try and grow it myself but it just may make the short list this time! Melons of every variety if i had the space. BEETS, beets and more beets!!!!! I would plant Raspberries! I love them and organic ones are somewhat hard to find where I live. If I could get them year round I would eat no other fruit! 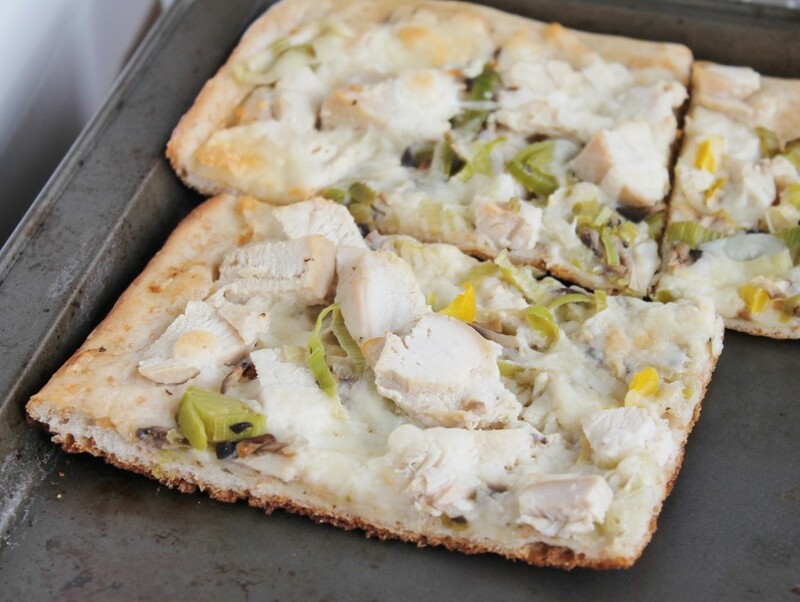 They would be delicious on this whole wheat pizza crust! I LOVE asparagus! ! Could eat it every day when it’s in season here in the Okanagan ! I love beets! we plant more every year. I roast them and from there I make so many things. Soups, salads or just on their own. Oh, and let’s not forget pickling them. We love lettuce! Any kind . We also love growing strawberries. If I could only plant one kind of seed in my garden, it would be peas. For most other vegetables I can get good ones at the farmers’ market, but the peas are inevitably overripe unless they’re homegrown. I would grow cucumbers. My kids love them so much. I would just have to make sure my daughter doesn’t pick up the cute little flowers they make at the beginning. I’d like to be able to grow coffee. That’s a warm-weather type crop, right? If I had only one seed I would plant tomatoes! I love having fresh tomatoes in the summer! 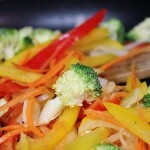 Plus there are so many uses for them; including fresh sauce for pizzas and pastas! For sure I would grow…CELERY ROOT!! I have been trying to find this for months now. I live in the city…close to Toronto…yet this is still a “mystery” veg to find. Tomatoes! BLTs, pizza, spaghetti sauce! I’d really love to plant rhubarb, but it doesn’t really get going for a couple years and by that time we’ll have moved to a new location — it’ll have to wait until we’re in our forever home! In the meantime, a new crop on my to-plant list this year is cauliflower. Excited to see if it’s a success! Carrots fresh from the garden are definitely thee best! I would love to be able to grow corn. I think string beans or snap peas! Carrots and zucchini because of their versatility for baking AND cooking! They also seem easy to grow, and I am an absolute beginner, plus these are veggies my son will eat! I will be growing my very first garden this year. This year I am starting small and simple with herbs and simple salad greens…maybe carrots and peas as well. Because we cook Italian so often and always make our own pasta sauce, I definitely would love to have a garden full of a variety of tomatoes! Spinach, several types of lettuce, carrots, and some fresh herbs always make it into my garden, as well as bell peppers, green beans, and zucchini. If we had more room i’d plant strawberries and blueberries. I love blackcuurant bushes ! Such a gorgeous book! I’d plant some kind of herb, maybe rosemary! I find fresh herbs so overpriced in stores, but they’re so easy to grow! Cherry tomatoes. I could live on those little suckers! I would grow CORN, I love corn but don’t buy it anymore since it is one of the highest GMO vegetables. KALE!! Easy to grow, can blanch and freeze it. great hidden in smoothies, and in other recipes. Then again, beets are amazing too, and green beans, and peas, and and and… I am getting excited for gardening season! I would definitely plant yellow tomatoes. They have a milder taste than the traditional reds and add a lot of colour to any meal. I want to try planting cucumbers again. We all love them! Beyond a shadow of a doubt, it would be tomaotes. I spend all year just waiting for that first ripe local tomato. Making me salivate already…. One seed that I would (and do) grow is basil. It’s the one herb that is so perishable that it goes brown in a day if I buy a bunch. That’s why I like to grow it and pick just what I need. I plant it in buckets on the balcony, I plant it in flower beds between my tulips and shrubs, I plant it in the kitchen on the windowsill… I plant it anywhere I can. There are so many uses for basil, but my faves are homemade walnut pesto, and on homemade pizza. There is nothing like fresh pesto on soft pillowy gnocci. Nothing beats a garden-fresh tomato! Oh and spinach, lettuce and tomatoes! I would absolutley plant leek! I had my first garden and I planted leek, but not enough:) I love winter leek and potato soup from all recipes. (With some minor changes) Also strawberries! Just saw this very cookbook at Costco today. It’s a really pretty book! If I could plant only one kind of seed it would have to be peas. They take a bit of room but the taste of straight off the plant is a fave for us. Tomatoes! Nothing beats fresh off the plant tomatoes! My favorite is Black seeded Simsom…. A leaf lettuce…it is so good…like warm butter melting on your tounge. We love to grow garlic! So fun as it grows quickly in the springhas a curly top which when straight is ready to pick! Our whole family loves pesto, a great use for garlic! We live in an apartment, so we don’t have the luxury of planting a garden. So for us, it would make sense to grow some herbs, like parsley or basil. Otherwise, lettuce and green beans would be nice for a garden. They’re easy to grow and they tend to yield a lot! oh gardening! With the weather we’re getting this week, it’s making me think a lot about it. If I had the room, I’d grow butternut squash. Really in love with all the versatile soups I make with them… although, since your roasted brussel sprout recipe (and the amount we’re chowing down on those lil cabbage balls), I’m thinking it would be really fun to try grow those as well! The cook book is gorgeous – should not be stuck in the recipe book cupboard, but out on the coffee table for all to see! Tough question, but cucumbers would be nice! Also Jalapenos are awesome! I would grow tomatoes. I’ve never tasted a tomato as sweet as ones fresh from a garden. My fave thing to grow, tomatoes, a selection of herbs, oh and kale. All things that everyone goes crazy for in my household. My favorite thing to grow in the garden is strawberries. I love how good they taste and they are ready early in the growing season. They are the perfect food to grow for this impatient gardener :). Tomatoes will be a close second once I get better at growing them. I’m hoping this year is THE year! Love my garden. If I could only plant one thing it would be carrots. Love fresh picked carrots. But, who would want to plant only one thing? That cook book looks really, really good! Just read about this new cookbook in our local paper! Looks great! Anna, I would love to have cheesecake seeds! Whoops, no such thing is there. Darn. In that case, herbs. Seeds for every herb I can think of. Even if I never have a use for an herb in my garden, I would love the look and aroma. Years ago, I had a large circular herb garden surrounded by concrete blocks. I grew chives in the openings atop every block–that was a lot of chilves, more than I could ever use. Each time my husband mowed the yard, I clipped a few inches off all the chives. Our yard smelled heavenly — grassy and chivy! I, too, love adding whole wheat flour to my baking, for the reason you mentioned–the nutty flavor. Any variety of fruit! Strawberries, blueberries, raspberries… not that it actually makes it inside my house when ripe… my daughter eats them by the handfuls right in the garden! The cookbook looks great! The cover is beautiful! I want apple trees. We’ve looked at them a couple of times, but we’re not quite ready to take away all the soccer, football playing space for apple trees…but one of these days I’ll have my trees! Thanks for the chance to win, the book looks awesome! I would plant kale or collards – they are so hardy and require minimal work! I barely even touched mine all summer and they still grew beautifully. Tomatoes, hands down. I usually do about 4 varieties, but if I had to choose one it would be cherry or grape tomatoes. I’ve been longing to snag a copy of this book! I’ve followed Aimee’s blogs for a long time now. I love fresh tomatoes and basil best fresh from the garden (sorry, I couldn’t pick just one since they go so well together), and, as for seeds, I wouldn’t want to do without my mixed lettuce that, when cut instead of pulled, last almost the whole summer to provide me with humongous, colourful salads! Since i love salads, I’d sow lettuce……..yummmm. green beans. There is nothing like fresh green beans from your backyard.